Pink blob, bulging, white eyes - slithery slither, blobby, gooey, slither. This soft, pink lump goes by the name of Globdule, but his cavernous existence is no life for a vibrant, thrusting young pile of goo. In fact, it is a blob's life in the catacombs and no right-minded barrel of nearly-purple stuff would want to spend the rest of his life there. But Globdule has ambition. Not for him the mudanity of rock life, eeking out a meagre living selling haberdashery to small insects. Oh no, for this almost-lilac bundle of sogy joy wants to be a toy - a plaything, if you will. George Michael sang about freedom, and even went to court to try and obtain it. But this would-be small child's pal need only complete a few levels of frenzied platform fun to escape his private hell. Stone free, to do what he please, our vaguely maroon chum would be happy as a lump of Playdoh - especially with a small child rolling him in the hands before putting him through a toy goo mncer. You get the idea. The kid wants outta that cave bad. But the journey to the toyship doth not run straight - you have to take a left at the lights and then first exit on the roundabout. There are lands to cross and levels to complete - there usually are in platform romps. What with slippity slippy ice, pools of water and nasties a-plenty to overcome, most toys would give in early on. Who would put money on Stretch Armstrong, Etch-a-Sketch or Bucking Bronco getting out of the castle? Exactly. Hey, but this reasonably mauve little fella is tough to control. He sticks to the walls like glue but fires off at all angles. And he looks permanently nervous in a tears-before-bedtime sort of way. But this only serves to make you more protective of him (for a while). You do not want your blobby sidekick to get spiked, or burned by the fires, or jumped by the mice, birds, bees or fish. And as for the spooks, snails, spiders - well, I do not believe you want to cross them. Instead, feast on the cakes, fruit and diamonds. Find the keys that unlock the doors to the next level, traverse the forest, swim the depths in your scuba gear and generally do things that you have done before in platform games. Globdule is fun, if a bit frustrating at times. It is a rather a stop-start affair - just when you are bowling along like a Ringo, you have to pull up and complete a tricky manoeuvre. The graphics are as cheerful as that woman from The Big Breakfast, though not quite as nicely drawn. The sounds are as squidgy as that bloke Princess Di called Squidgy (allegedly) but the music is nowhere near as good as the theme tune to The Rockford Files - but there is no shame in that. Unfortunately, the charge of 30 sovs is somewhat excessive. There are many good games out there at a third of the price of our pink pal. An attractive but unspectacular platformer with plenty of depth levels-wise, but not enough tricks to keep you coming back. A tad expensive at 30 knicker too. Pretty, cute, well pretty cute but rather less than outstanding. Glob's animation is nice, though. A rather nasty tune, intermingled with effective squashy, squidgy noises. Actually a lot of fun, though whether you will playing it three weeks later is another matter. 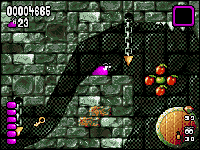 Bags of things to collect, loads of levels but Mr Globdule can be difficult to control at times. Bei Psygnosis beschloß man, daß "Bob's Bad Day" nicht das letzte originelle Geschicklichkeitsgame aus Liverpool gewesen sein soll - die Wahl des Helden fiel entsprechend ungewöhnlich aus: ein Schleimklumpen! Wie es seine Spezies so an sich hat, kann Globdule nicht laufen, sondern nur an den Rändern von Mauern, Felsen oder anderem festen Undergrund entlangkriechen und auf Knopfdruck mal einen kurzen Hopser machen. In kritischen Situationen setzt er zu einem gemeingefährlich aussehenden Drehsprung an, der auch ein gutes Mittel gegen die gelegentlich auftauchenden Flöhe, Bienen, Kühe oder Kuschelsaurier darstellt. Gerade die Dinos erweisen sich als extrem hartnäckig, wenn es darum geht, dem armen Schleimer sein bißchen Energie und in weiterer Folge seine drei Leben zu mopsen. Für zusätzliche Abwechslung sorgen Feuergruben, herabfallende Speere, rutschige Eisoberflächen und tückische Unterwasserebenen. Um Schleimi ein faire Chance zu geben, haben die Psygnosen eine ganze Reihe von Bonusgegenständen auf seinem Weg plaziert: Äpfel, Birnen, Trauben, etliche andere Obstsorten und Sterne frischen nicht nur den Energiehaushalt auf, sondern lassen sich bei entsprechender Sammelwut auch in Extraleben ummünzen. Um die kleinen grauen Schleimzellen ebenfalls zu beschäftigen, gibt es Türen in verschiedenen Farben, die nur mit dem passenden und meist sehr gut versteckten Schlüssel geöffnet werden können. Von Zeit zu Zeit kriecht Globdule auf Falltüren zu, die entweder zu neuermeßlichen Schätzen oder zu seinem vorzeitigen Ableben führen. Ebenfalls etwas unsichere Sachen sind die vor allem in den späteren, mehrere Bildschirme umfassenden Levels vorhandenen Teleporter, weil man bei ihnen nie so genau weiß, wo die Reise endet. Ob es Mutti nun paßt oder nicht, die niedlich animierte Grafik ist jedenfalls zuckersüß gezeichnet und wird butterweich gescrollt, wobei speziell die vielfältigen Bewegungsabläufe der Heldenkugel immer wieder ungläubiges Staunen hervorrufen. Auch akustisch wird fleißig geblubbert und fetzig musiziert, lediglich das Handling des Schleimbeutels erscheint manchmal etwas hakelig - da es keinerlei Zeitdruck gibt, stört das allerdings kaum. A rounded mass of some thick fluid. Sociology GCSE examination paper. Question 2 (c). The amorphous blob in late 20th century culture has been represented as a monstrous evil, metaphorically representing the'horrors' of communism and losing one's freedom of self-expression. Discuss. While it is true that in films such as The Blob and in numerous SF and superhero comics of the fifties and sixties the amorphous blob has been represented as the villain, there has been a marked move away from this viewpoint in the last decade. This was spearheaded by the ground-breaking animated series Trap Door, which featured a character called Drut. Support for the 'blob as hero' trend has continued from a rather surprising sector - computr games. Characters as Putty and, indeed, Blob have forced the public to rethink their attitude towards the amorphous blobs. In this essay, however, I shall be concentrating on the game Globdule to present my case. Globdule is a classic amorphous blob exhibiting all the requisite characteristics. He is small and virtually featureless except for the boiled-egg eyes. He is extremely pliable, bounces better than an Arthur Daley cheque and absorbs thing, including his enemies. The story, however, is completely atypical. Globdule does not rampage through Tokyo destroying skyscrapers, or even splat-snogging small-town teenagers by entering their Buick through the exhaust pipe, as standard blobby behaviour would have us expect. No, he wants to become a toy, and the only way that can happen is by travelling through some catacombs, absorbing everything in his path. In fact, the plot is about as relevant to the fabric of the universe as knitted doll toilet roll covers (the irony of plots being the last thing to be thought about in the creation of a computer game is covered in 'Stories, Schmories, Where's The Gimmick' by Professor I Dunnow). Globdule is a cutesy platformer, and conforms to all the ground rules of cutesy platformers. Indeed, the term 'cutesy platformer' has taken on a pejorative meaning and has come to be used as a term of derision as in, "Oh no, not another cutesy platformer, I'd rather stick my head down a toilet!". But in the case of Globdule, it can be seen that this prejudice is very unfair, much the same way as amorphous blobs being seen as evil rampaging monsters is unfair. It is al done with such style it overcomes the facts that its roots show more than Cindy's on Eastenders. 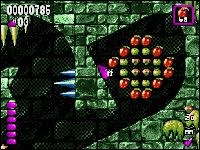 Globby bounces and creeps through a series of caverns collecting fruit (for energy) and stars (for extra lives). In each cavern he also has to absorb a certain number of crystals and baddies before the exit opens and he can telepoprt to the next cavern. 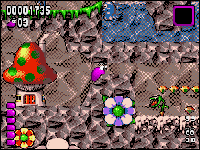 Baddies have to be stunned before they can be absorbed which Globby does by bouncing on them. Larger baddies need to be hit with a spinning jump; the larger the baddie the more Globby has to spin. When they have been successfully stunned they are repaird to a pair of eyes which Globby then picks up. 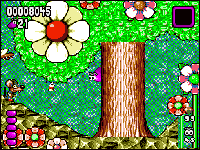 The nearest thing the game has to an original gimmick is that Globby sticks to anything - walls, ceilings, bushes, all the cutesy platformer clichés - and the direction he bounces often depends on the angle of the surface he is on before he launches. You can also control Globby inflight which can make for some spectacular aerobatic which, on some levels, are crucial to be able to rach particular ledges or keys. Keys. Ah, yes. Another of those platform clichés. Yes, in Globdule you have to find keys to unlock doors. Things really do not sound good for this game, do they? But do not judge too harshly, because, like the amorphous blob, it should not be condemned by its predecessors. It is actually dead good fun and instantly addictive. It looks great, it plays well and the learning curve is pitched perfectly. Graphically it gets off to a slow start (the first level is a bit dingy) but pretty soon it turns into a visual treat with some brilliant daft nasties (the mad cow is my personal favourite) and some superbly bizarre and colourful locations, some of which seem to be the product of an imagination so fevered it ought to see a doctor pretty soon. And some of the levels are huge You are lulled into a sense of familiarity with the first cavern, which is only one screen big, but they soon grow to epic proportions in which finding the exit is tricky enough, let alone collecting all the necessaries. Each new level has some new challenge and some great new nasties that keep the gameplay fresh. It is the little incidental details, such as the scuba gear that appears when Globby reaches an underwater section and the slidey surfaces which appear when you least expect (or want) them, which help lift Globdule out of the average and into the really quite good, as it happens. There is more than one route through the catacombs, which means there are loads of levels to bounce through. Plus each level has a number of caverns, making Globdule a pretty meaty game, one with a decent life in it (unlike the teenagers in the amorphous blob films of the 50s). Er, anway, in conclusion and getting back to the case I point. Globdule is one of the new breed of amorphous blobs, who, along with Putty, is proving that having no limbs does not make you a bad entity per se. It is a shame that the game he appears in is so derivative, as it could lead to accusations of him being a poor imitation of Putty and a dozen or so other cutesy latforms games, and to be honest, it is not as good a game. But it is still good. Darned good. Globdule deserves to be recognised for this great contribution to this genre. Personally I loved it, but then I love these sort of games so I am biased. I will temper my enthusiasm by admitting that it is derivative and hardly breaking any new ground. But frankly I do not care. UPPERS Huge game with loads of levels. Excellently cartoony graphics. Instantly playable and instantly get its hooks in. In terms of presentation and programming it is polished stuff. DOWNERS Frankly it is hardly got two original ideas to rub together. At heart it is a cutesy platformer by numbers. I think it is quite a bit faster... but that could just be me fooling myself so that I would have something to write in this box.